Kutna Hora is a town with a glorious history of silver mining. 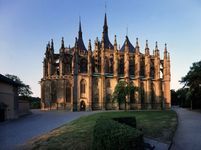 Added to the UNESCO List of World Cultural Heritage, the town is located less than 70 kilometres to the east of Prague. 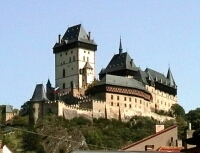 Karlstejn is a Gothic castle built as a treasury for the crown jewels. 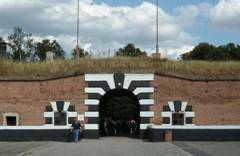 The castle, the most frequently visited Czech monument of its kind, is located 40 kilometres to the south-west of Prague. Konopiste Castle, lying 45 kilometres to the south-east of Prague, served as the summer residence of the successors to the crown, Archduke Franz Ferdinand d'Este. The exhibited collection of historical weapons and armour is the largest of its kind in the Czech Republic. 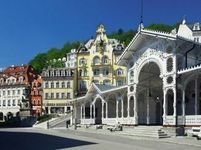 Karlovy Vary is a world famous spa with a rich history. In the city you will buildings constructed in many styles from classicism to Art Nouveau. It is famous as a spa city and as a city where important personalities from the aristocracy, politics, art and science meet. 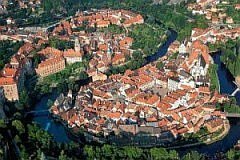 Cesky Krumlov is a town of historical heritage - 300 protected buildings in the historical centre designated as a UNESCO World Heritage Site, the second largest castle complex in the Czech Republic, and the oldest Baroque theatre in the world. One of the most highly-sought chateaux in the country, the Hluboka Chateau, rises above the northern edge of the Ceské Budejovice pond basin on a steep promontory above the Vltava River. An English chateau park surrounds the chateau. The castle of Krivoklat belongs to the oldest and most important castles of the Czech princes and kings. The history of its construction starts in the 12th century. The Renaissance Nelahozeves Castle is interesting not just for its painting gallery, but also as the site of a music festiral in honour of the local native, world-famous composer Antonín Dvorák. The castle lies less than 40 kilometres to the north of Prague. 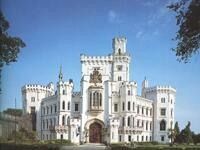 The Renaissance water chateau Cervena Lhota is one of the most romantic monuments in Bohemia. It rises up on the rocky island surrounded by a lake.